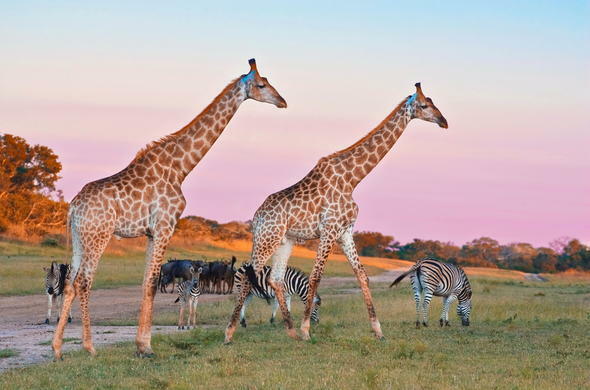 Most people today know the Sabi Sands more for its luxury lodges and Big Five than as a park of great species diversity, but as the wildlife checklists of the area show it is truly a wildlife paradise. Adjoining the Kruger National Park, the Sabi Sands shares much of the diversity that the legendary Kruger Park is famous for. The area has always been a wildlife sanctuary, saved in part from cattle farming by the incidence of foot and mouth and sleeping sickness that kept man and livestock out. The early landowners used the area for recreation and hunting before turning to the luxury Big Five Safaris of today. In the 1960's the management of the Kruger National Park decided to erect a fence between the park and the neighbouring private reserves, to prevent diseases from infecting the wildlife of the park. This prompted the Sabi Sands management to fence the whole park in to prevent the wildlife from moving out into the neighbouring areas. Constant monitoring of the wildlife was essential to protect the diversity of the area. In the 1990's the fence between the Kruger Park and the Sabi Sand Private Game Reserve was pulled down after an agreement between the conservation bodies of both parks was forged, allowing wildlife to roam freely again across both regions. The lodges in the Sabi Sand Game Reserve are involved in environmental management and conservation programmes that ensure the wellbeing of all the wildlife species in the park. Projects that are part of the environmental programmes include alien plant control, micro catchment management to combat erosion, monitoring of wildlife and habitat densities, anti-poaching activities and fire control management. The conservation bodies in the Sabi Sands work closely with the officials of the Kruger National Park to ensure that the wildlife of the region is managed in accordance with conservation principles. The Sabi Sands is renowned for the Big Five (Lion, Leopard, Elephant, Buffalo and Rhino). In fact it was in the Sabi Sands where the hunting concept that is the Big Five was rekindled as a photo safari term. So successful was this term marketed in the photo safari arena that today it is taken as the apex of wildlife viewing whilst on safari in Africa. But it is not only the Big Five that can be seen in the Sabi Sands - just a glance at the species lists show the incredible diversity of wildlife in the reserve. The lists contain 145+ mammal species, 500+ bird species, 30+ amphibian species, 110+ reptile species and 45+ fish species.